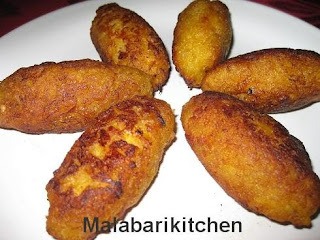 This is simple tea time snack and another tasty snack from Malabar which is made with ripe Banana. This can be made in different methods. You can make the filling with egg or without it. The below preparation is without egg one. & cardamom powder into it. =►Saute it till the sugar completely melts and keep it aside (1-2min). =►Boil ripe banana (only half ripe) and mash it to a fine paste (like chapatti dough). =► Make small balls like chapatti balls..
=►Take the dough ball in hand and press it with palm to make an oval shape. =►Press the edges and close it so that it retains the oval shape. =►Heat ghee or oil in a pan and fry till it turns golden brown (deep fry). Note: If the dough is little bit loose, add a little rice powder or bread crumbs. We can do shallow fry but the taste will be little lesser than deep fed one.